Written submissions to the committee from SBS and Save Our SBS put the case for set quotas of Australian content saying it ought to be fully-funded. Save Our SBS argued that if content were fully-funded, there would be no point in SBS carrying advertisements. To stay faithful to its Charter, Save Our SBS said that SBS needs to present more programs in languages other than English, and that could be done via a separate SBS TV channel. 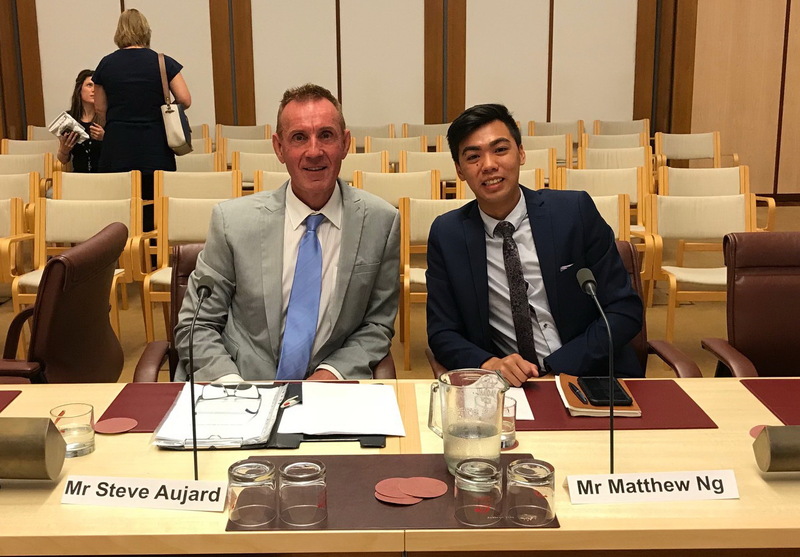 Today, the Save Our SBS President Steve Aujard (pictured left), and Vice President Matthew Ng (pictured right), appeared before the Senate communication committee’s Inquiry into Australian content on broadcast, radio and streaming services. Their opening statements are below. Firstly, thank you for inviting Save Our SBS to this hearing. Save Our SBS is the national peak body advocating as a supporter and friend of SBS and for consumers of SBS. Without a doubt the SBS Charter requires Australian content, although it does not specify a quantity. Broadly, we support SBS in their submission regarding Australian content. There are however differences between our submission and theirs. SBS asked that ‘a quota of around 30% fully-funded Australian content apply in peak‑viewing for its main channel’ WHEREAS, we said that ‘in primetime a fully-funded quota of first run Australian content ought to commence at 30% on the main SBS channel and over time be increased to 55%’. 55% is the minimum regulated requirement of free-to-air commercial television. When we speak of increasing Australian content, the aim is to boost Australian drama especially, and local documentaries, which SBS and Save Our SBS say needs to be fully-funded from the public purse – not from advertising. We are not really referring to news or sporting programs when we discuss Australian content. This is about Australian drama and documentaries. Now here is where our submission differs somewhat from SBS’s submission. In addition to mandating a quota of Australian content, we also said that to balance SBS Charter obligations, there ought to be a dedicated SBS channel that is required to broadcast a very high content of programs in LOTE – languages other than English. Whilst our members and supporters want to see more Australian content on SBS, they do not want that to occur at the expense of LOTE content, which is already too low for a multilingual broadcaster. Any keen viewer of SBS will have observed that since the advent of in‑program commercial breaks on SBS back in late 2006, there are less and less foreign language programs – movies, TV serials, art and experimental programs and the like – on all SBS channels and in primetime in particular. In fact, it is not uncommon for an entire nights viewing on SBS to have absolutely no LOTE content at all. This is far from the SBS that most people once knew. A really good reason for regulating a set quota of LOTE content is to foster some key requirements contained in the SBS Charter, for example, ‘as far as practicable programs be in their preferred languages’. Other sections in the Charter require SBS ‘promote understanding and acceptance of the cultural, linguistic and ethnic diversity of the Australian people’ and ‘contribute to the retention and continuing development of language and other cultural skills’. Certainly SBS Radio achieves all this very well what with its 70 odd languages around the clock. SBS television once fulfilled these Charter obligations too. But by and large, LOTE content is not a ratings winner which is why there is little or no LOTE content in primetime on SBS television. Setting aside the daily news programs in other languages, there is not much LOTE content on SBS-TV anyway. There is LOTE in SBS On Demand, but it is not always easy to locate and there are still many viewers – especially older viewers from various ethnicities – who prefer free-to-air viewing ‘in their language’, which as I said before, the Charter requires. Certainly if there were an increase in Australian content on the main SBS channel without a requirement to increase LOTE content on another SBS channel, you can be pretty sure – based on the experience of the past decade since the introduction of in‑program commercial breaks to SBS – that LOTE content will just slip further and further into the past, despite there being a range of languages other than English spoken in the community. The commercial appeal is just too low for SBS to want LOTE in primetime. Therefore it needs to be set by a minimum quota to give meaning to the Charter. SBS stated that they wanted Australian content to be fully funded and so did we. But let’s tease this out a bit. every dollar spent by SBS generated three times that amount in Australian film and television productions with more employment in the industry and a greater range of programs. A return of three times that invested is pretty good. Who could argue against that!? That was 12 years ago. But it gets even better. More recently we have the work that we cited commissioned by Screen Producers Australia with the Australian Subscription Television & Radio Association provided by PwC that ‘increasing the Producer Offset from 20 to 40% would effectively stimulate the economy by a factor greater than six’. Whilst recent data specific to SBS is lacking tabulating the extent to which the economy would be stimulated by direct funding of Australian content commissioned by SBS, the evidence suggests it is at least three and more likely greater than six. We think it may be even higher, up around 10. Whatever the figure, such stimulus and the resulting increased productivity is reason alone for government to fully‑fund SBS in lieu of advertising. This is aside from the cultural benefits of increasing Australian content on SBS. In our submission, we outlined the pitfalls of SBS carrying advertising and the way SBS has changed since the introduction of in-program commercial breaks in late 2006. So I don’t intend to go over that ground right now other than to point out that we provided three options to remedy this. I am happy to recap those options later if you wish. So that raises the question: Why did the 1991 parliament allow SBS to take advertising? To be clear, the only reason advertising was introduced on SBS was to fund Australian content and to the same level as for commercial TV. That was the rational. To give this some context, that means if Australian content were now to be fully funded – which is what we are recommending, and so is SBS – there would be no point in SBS carrying any advertising. And why would you want it anyway? Unfortunately, the advertising experiment has failed dismally to come anywhere close to the 30% quotas SBS now want, let alone the 55% of commercial television. On a special public broadcaster like SBS with its Charter obligations, advertising – at least in its current disruptive highly commercial format – is a very destructive policy and presents too many problems. By any measure the policy has failed to achieve the outcome intended, and 85% of SBS viewers nationally believe ‘advertising should have no place on a public broadcaster’ anyway, while 95% say that ‘in‑program commercial breaks on SBS impede their viewing experience’. And that brings us – and SBS – to the point that we now say, ‘just fully fund Australian content on SBS from the public purse’. The nation will be richer for it. To take this one step further, although SBS advertising revenues have grown 123% since the introduction of in‑program commercial breaks in late 2006, Australian content has not. In fact the SBS Annual Reports inform us that first run Australian drama is only 2% of SBS’s schedule. That needs to be significantly increased, and it’s never going to happen from advertising on SBS. Never. And no one wants that on SBS anyway. In our submission, we discussed the now defunct independent commissioning arm of SBS – SBSi – or SBS Independent as it was known. The abolition of SBSi – which occurred with the introduction of in‑program commercial breaks – was like a nail in the coffin for independent Australian film-makers and something really unique that distinguished SBS from all other broadcasters. SBSi fostered ‘innovative forms of expression’ – which by the way, is a Charter requirement – and since its abolition, SBS has suffered. That’s the consequence of SBS ramping up its commercial side. It’s absurd that in the 21st century funding for our national multicultural broadcaster is so woefully low that the best we can see, is a mere 2% of Australian drama on it. Other public broadcasters around the world do much better than this. Many people in the industry have referred to the past decade or so as the ‘golden years of content’. Unfortunately, it all but slipped by SBS. For the sake of a cohesive, well functioning, safer society and to ensure social cohesion, it’s about time government invested heavily in SBS with public funds in place of the destructive advertising model and all the problems it presents. It’s a no brainer. Let’s not forget, SBS is the Special Broadcasting Service. We need to treasure it, and fund it to ensure it is special.